One die-hard Star Wars fan wasn’t able to watch the third and final Star Wars: The Force Awakens trailer when it aired live during Monday Night Football. He’s 11, and needed his sleep. (Parents understand that a grumpy middle schooler can have the temperament of a Wampa, so sleep is precious.) This morning, as soon as he came downstairs, I had the trailer keyed up on our television, the sound cranked up high. It got all of the reactions I expected out of him: applause; cheers; questions; a request to watch it again. And it got one out of me that I didn’t expect. I finally got choked up. Like all of you, I watched the trailer live on Monday night. 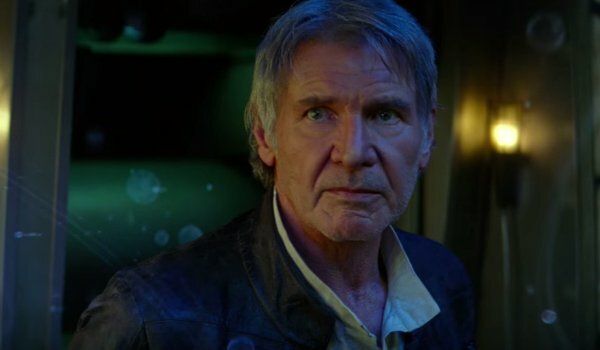 The sets, the practical effects, Han Solo (Harrison Ford) commenting on his legacy… all of it confirmed my belief that J.J. Abrams is about to stick the landing by delivering the first great Star Wars sequel in years, as well as the opening salvo in what could be the defining series of the next generation of blockbuster-film geeks. Yet, like a cynical homicide detective who has witnessed one too many crime scenes, I still viewed the trailer through a protective glass. It’s a trailer. A marketing device. And one of a hundred we have seen this year. Yes, The Force Awakens trailer helped make the upcoming movie look fantastic… but it didn’t emotionally grab me. Seeing it through my son’s eyes? A totally different ball game. My 11-year-old has a different portal into the Star Wars universe. He’s a huge fan of the animated Star Wars Rebels, and he has spent a good deal of time catching up on the Clone Wars episodes. And while we have watched all six of the previous films numerous times, his true heroes in this world aren’t really Luke Skywalker (Mark Hamill), Han Solo (Ford) or Princess Leia (Carrie Fisher). They are young Anakin Skywalker – the animated version, not the wooden Hayden Christensen – Kanan Jarrus (Freddie Prinze Jr.), Sabine Wren (Tiya Sircar) and, naturally, Ezra Bridger (Taylor Gray). He’s instantly curious about Rey (Daisy Ridley) and Finn (John Boyega), and the sight of BB-8 got the first – and loudest – gasp. He needed to know, immediately, who Kylo Ren (Adam Driver) was. But he wasn’t asking for Luke. He barely noticed Chewie. He’s familiar with the new, and was actively looking forward to it. And that’s when it truly hit me. As much as Star Wars: The Force Awakens will try to rescue George Lucas’ beloved franchise from the shadow cast over it by the Prequel Trilogy, it’s not just about us. This movie also – perhaps in a more significant way – needs to be about trying to stoke the same flame of passion in the next generation, the kids who have been looking for that storyline to call their own for far too long. During the run up to The Force Awakens, I personally have been recognizing the need for Abrams’ Star Wars to succeed so that – from a business perspective – Disney could continue to tell stories in this universe. Reporters look at the bigger picture. Because let’s face it. If, by some stroke of terrible luck, The Force Awakens is a creative misstep on the level of The Phantom Menace, the majority of fans aren’t coming back for Episodes VIII and IX, or for Rogue One. But it’s not completely about dollars and cents for Star Wars. It’s about so much more. It’s about passion. It’s about loyalty. It’s about belief. And the title The Force Awakens actually works better as a nod to the rekindling of that passion in a new fanbase, in a younger generation who will proudly anticipate Star Wars movies the way that we once did. I saw that spark in my son’s eyes this morning as he watched the spectacular trailer for Star Wars: The Force Awakens. And it awakened in me an enthusiasm for this universe that I truly haven’t felt in ages.